Hunter Holmes McGuire, MD (October 11, 1835 to September 19, 1900) was a physician, teacher, and orator. He started several schools and hospitals that later became part of the Medical College of Virginia (MCV) in Richmond. His statue sit prominently on the grounds of the Virginia State Capitol. Nearby the McGuire Veterans Administration Medical Center is named in his honor. 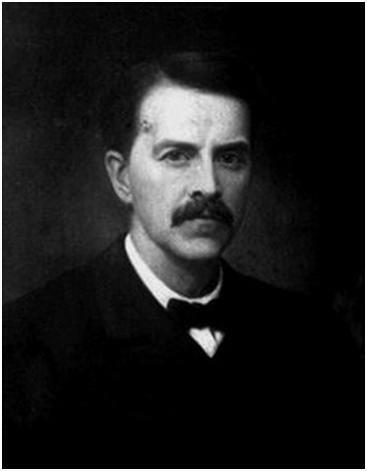 Hunter McGuire was born in Winchester, Virginia, to a prominent eye surgeon, Dr. Hugh Holmes McGuire, and his wife, Eliza. Young Hunter was one of seven children. He often accompanied his father and studied medicine at the Winchester Medical College where he graduated in 1855. His continuing medical education in Philadelphia was interrupted by the onset of the hostilities that led to the American Civil War. He taught briefly at Tulane University in New Orleans before joining the Confederate army in 1861. Dr. McGuire joined "The Winchester Rifles," company F, of the Second Virginia Infantry, Confederate Army, as a private. However, his services were much more valuable as a doctor rather than a front line soldier. McGuire was made a brigade surgeon and ordered to report to Gen. Thomas J. Jackson at Harpers Ferry. Jackson initially scoffed at McGuire's youth, but the two became very close as the war progressed. Dr. McGuire treated Gen. Jackson after the first battle of Manassas, where the general picked up the nickname "Stonewall" Jackson following an exclamation by Gen. Barnard E. Bee Jr. (who himself was killed during the battle). In 1862 McGuire was promoted to chief surgeon of Jackson's Corps, serving in the Army of Northern Virginia under its medical director, Dr. Lafayette Guild. In May 1863, Jackson was gravely wounded by friendly fire near Chancellorsville, and Dr. McGuire amputated his left arm in a vain attempt to save his life. Jackson died of pneumonia a few days later. His last words were recorded by Dr. McGuire as: "Let us cross over the river and rest beneath the shade of the trees." The death of Jackson affected McGuire greatly. He would always remember Jackson with the deepest reverence and served as a pallbearer at Stonewall's funeral. At the battle of Gettysburg two months later, Dr. McGuire amputated the leg of Gen. Isaac R. Trimble after Pickett's Charge. He later served under Gen. Richard S. Ewell and Gen. Jubal Early. After the war McGuire contributed to the first of the Geneva Conventions, which is why the Boston Medical Journal said in his obituary that he had "humanized war." After the Civil War ended in April 1865, Dr. McGuire returned to Richmond, Virginia, where he became chair of surgery at the Medical College of Virginia. He married Mary Stuart of Staunton, Virginia, in 1867. They had ten children, many of whom followed in his footsteps into medicine, notably Dr. Stuart McGuire. They maintained a summer residence just west of Richmond in Bon Air. Dr. McGuire was president of the American Medical Association and numerous other organizations. He has been described as a brilliant administrator and a gifted teacher and orator, and he also wrote prolifically. He founded St. Luke's Hospital and Training School for Nurses, helped found the Medical Society of Virginia, and in 1893 he started the College of Physicians and Surgeons, later University College of Medicine. American sculptor William Couper immortalized Dr. Hunter Holmes McGuire with a statue, placed on the grounds of the Virginia State Capitol in 1904, two blocks from his beloved hospital. The inscription upon it reads: Hunter Holmes McGuire, M.D., L.L.D. President of the American Medical and of the American Surgical Associations; Founder of the University College of Medicine Medical Director, Jackson's Corps, Army of Northern Virginia, An Eminent Civil and Military Surgeon and Beloved Physician. An Able Teacher and Vigorous Writer; A Useful Citizen and Broad Humanitarian, Gifted in Mind and Generous in Heart, This Monument is Erected by his Many Friends. In 1913 his University College of Medicine became part of the Medical College of Virginia (MCV). McGuire Hall was named in his honor at that time. The following year, his son Dr. Stuart McGuire was named president of the combined institution, a leading medical center. In 1968 MCV became part of Virginia Commonwealth University (VCU). The Hunter Holmes McGuire Veterans Administration Medical Center in Richmond was also named in his honor. It was the first VA hospital to perform heart transplants. The McGuire VA Hospital, as it is known locally, has a full range of health care services ranging from comprehensive outpatient care to complex inpatient services such as heart, liver, and lung transplantation, and care of traumatic brain and spinal cord injuries. The medical center has 427 operating beds, which includes acute care, spinal cord injury, mental health services, and a skilled nursing home. Dr. McGuire's great grandson and namesake, Hunter Holmes McGuire Jr., while professor of surgery in VCU, served from 1976 to 2000 as chief of surgical service in the McGuire VA Medical Center and president of the Association of VA Surgeons. Source of information: Handley Regional Library, Winchester-Frederick County Historical Society, Hunter Holmes McGuire Collection.